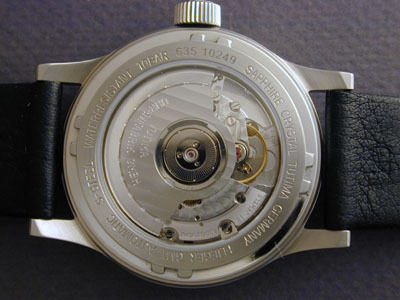 Caliber 59, first produced in 1941.
and was sold to Dieter Delecate. 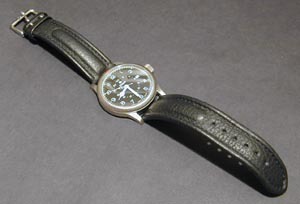 other watches which share similar styling. classic styling and reasonable price. (I have not received the cap as of yet). 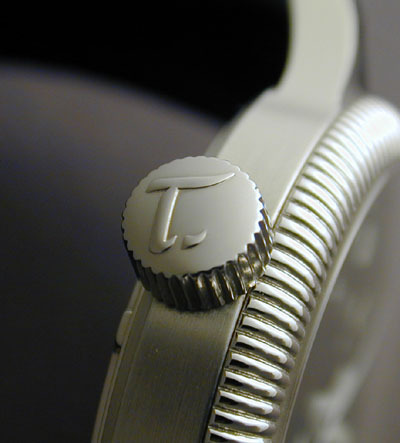 and coin-edged rotating bezel sets off the brushed finish of the case nicely. impressed how well a simpler version comes across. 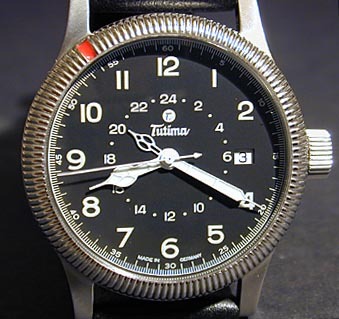 No, it isn’t an authentic military dial, but it has a great retro feel to it – especially when combined with the classic calf-skin aviator band. One of my non-watch enthusiast friends commented that the styling reminded him of the Audi TT. 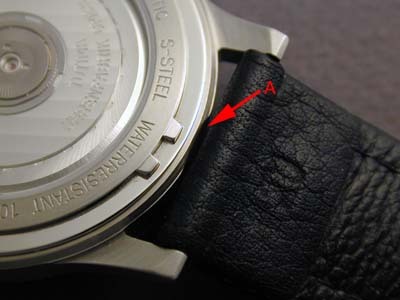 3.5mm high crown), and is 10mm thick measure from the caseback to crystal. Incabloc shock protection. Power reserve is the standard 42 hours. nickel-plating. The screws are polished, but are not blued. level of finish is definitely very good. 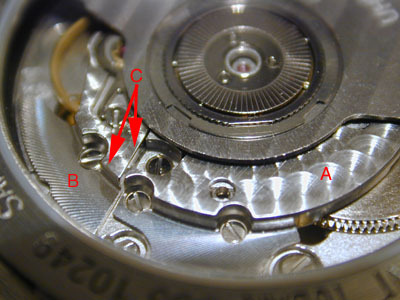 ETA 2893-2 movement for a professional pilot. 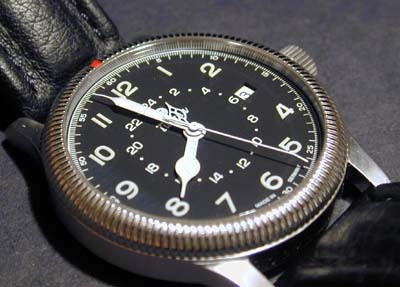 pilot as they have a constant 24 hour reference and a quick-set 12 hour hand. reference, 2893-2 based watches are probably fine. 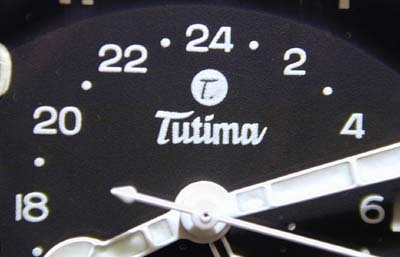 The Tutima GMT comes with a very nicely done brushed finish on the case. gets missed by the lower end manufacturers. 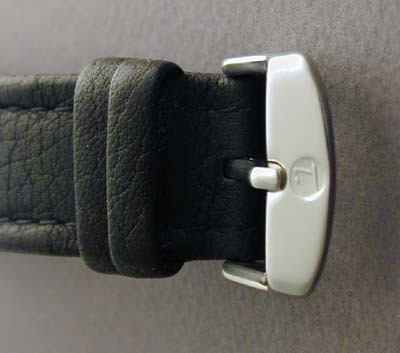 the strap from rubbing on the case. with an aftermarket deployant clasp. seems out of character with the rest of the watch. at 28,800 bph really ought to use 1/4 second subdivisions). 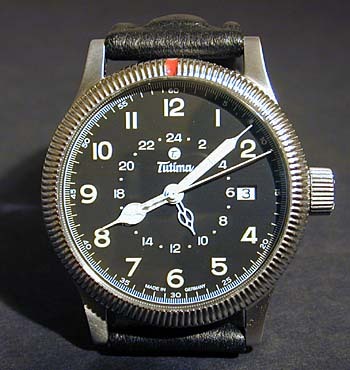 than the twice-as-expensive NATO Chronograph or even the military Sinn watches. of an ETA 2824 already distinguishes it from most of the similarly priced competition. 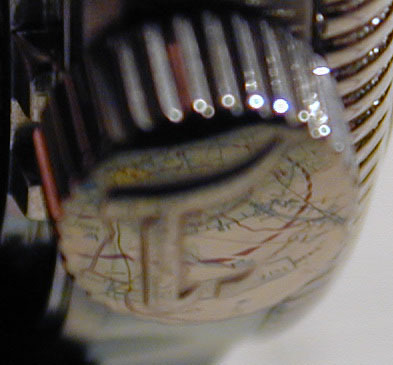 My only reservation with this watch is the design of its GMT function. of the movement belie its low cost.